With a woodgrain-patterned structure, this baby gym has a whimsical outdoor feel. 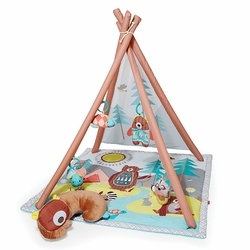 The printed mesh backdrop sets the ultimate campground scene, while the plush, sleeping bear tummy time pillow encourages developmental milestones. A light-up firefly, musical raccoon and other nature friends help to develop baby’s sensory skills. Requires assembly by an adult. Activity Mat and Tummy Time pillow should not be placed in crib or playpen. Use this product only on the floor. Never leave baby unattended on mat.